Forged by the harsh climate of the steppes, the Mongolian horse is derived from millennia of ruthless natural selection, which is added to a very ancient human selection. Small, almost a pony, its toughness is legendary, however, and he accompanies the nomads of Mongolia in their daily lives. It provides them with means of transport, milk, and sometimes meat in winter. So it's no surprise that we find some genes of Mongolian horse in many horse breeds that are found on the road of the conquering army! Most recently, there has been attempts to cross the Mongolian horses with Arabian horses, to try to give them a little more height while maintaining their endurance qualities. These horses have actually proved bigger and faster, to the point they had to be separated from traditional Mongolian horses during Naadam races. Hopefully these initiatives will not lead to a loss of the original model. The Mongolian horse is small, with a particularly developed forequarters, a short and massive neck. The body is wide, the back and legs are short with good joints. Compared to its size, the Mongolian horse is very strong, and very tough. The horses are almost never shod, except in winter in the Lake Khovsgol region, in order to fix spikes to horses that pull the sleigh on the frozen lake. Almost all colors are possible, including those with very old signs such as zebra stripes. 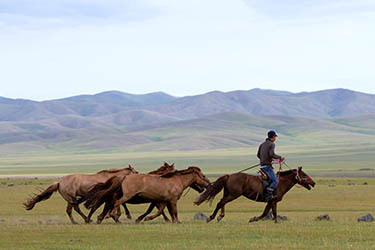 Mongolian nomads do not have a name for their horses, they call them by their color, and they have dozens of different terms to describe the subtleties of possible colors of their horses. The Mongolian horse has a docile temper, since even spending months in freedom in the steppe, it shows a very quiet behavior as soon as its owner catches it for the ride. 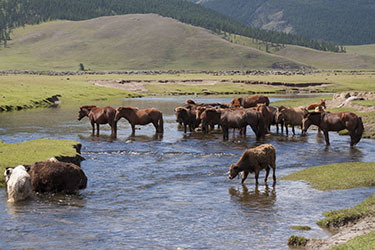 However always keep in mind that the Mongolian horse retains many wild behavior, because of this lifestyle, especially a very suspicious character. 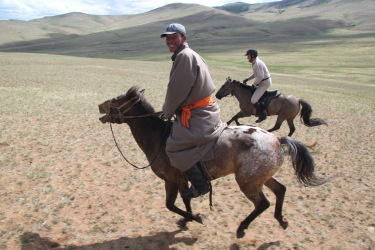 It is often said that there are as many horses as men in Mongolia, and it is true that they are about three million.